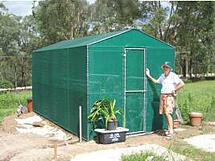 Growing vegetables and flowers or trees during the summer months in Australia has always been difficult. This is due to high temperatures, high water needs of the plants, weeds, insects, diseases and sometimes long periods of rain. With a quality shade house in place, regardless it is small or large, there are so many benefits associated with it (See below). 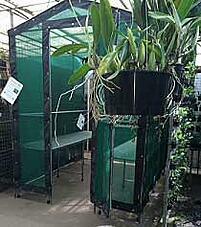 It is a valuable asset to have when it comes to growing plants and protecting them properly. 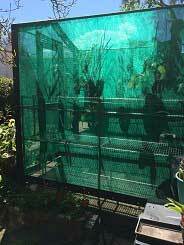 Normally a propogated plant would be moved out from a igloo or glass house production area to an area with 70 or 80% shade, then after a period of time it would be moved to an area with 30% shade and thereafter into the full sun. What is a shade house? 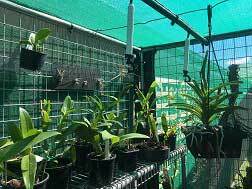 A shade house is for maximum growing of indoor, shade loving plants (as opposed to full sun in a greenhouse/Glasshouse/Hot House) as well as for raising seedlings. 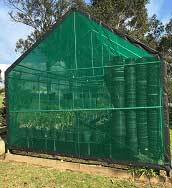 A shade house is a structure which usually consists of a metal frame that supports shade cloth - a type of screen that provides some passive environmental control e.g. shading the plants from excessive sunlight and wind. 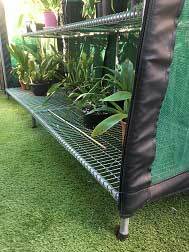 In warmer climates shade houses are useful for growing a range of plants that grow well in cool to temperate regions but do not cope with the amount of hot direct sun. 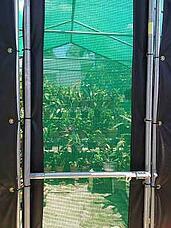 In a cold snap, more elaborate shade houses can be heated to prevent frost damage to the plants. Which plants need to be grown in a shade house? 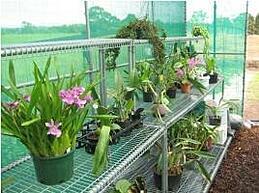 Research has proven that optimal shading conditions effect significantly the growth aspect for many species of plants. Why use a shade house? Grow vegetables, cut flowers or berry fruits out of season, faster than might be achieved outside. Why use C-Mac Shade House? Australian manufactured over the last 50 years (proven performance). 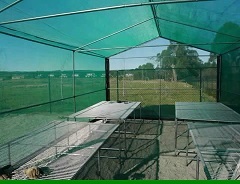 No sharp edges or protrusions to damage valuable shade covers. Frame is spaced off ground for extended life. 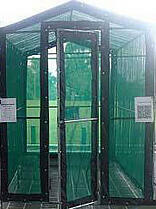 Made from heavy duty galvanized steel tubular frames (galvanized internally and externally). Supplied in D.I.Y. kit form (Made to order). Precision made patented joints which simply socket together. Easy to assemble with 3D instructions – no bolts or clamps. 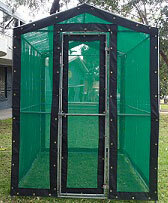 Shade House Kits available in gable roof, flat roof and Lean-to. Large range of Bench Kits available for shade house benching - using the same materials and construction methods. 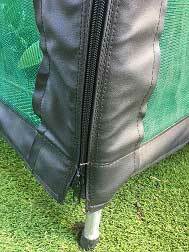 Shade cloth covers simply tie to frame using plastic cable ties through eyelets providing a smooth, tear free, clean finish. 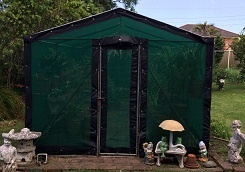 Separate sections provide for easy replacement if shade cloth should be damaged at any time, without the expense of having to replace the complete shade house cloth cover. 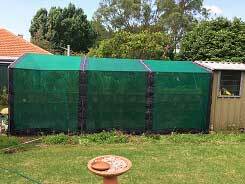 Shade house coverings are made in 3.2m wide sections (not a single piece cover) for easy assembly and replacement. 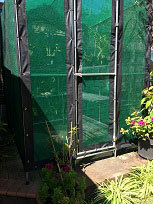 When it comes to replace or update “shadecloth” on your existing shade houses, shade cloth can be purchased from C-Mac. The replacement shade cloth will be tailored to your sepcific dimensions. 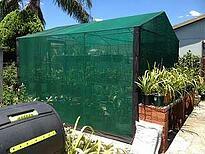 How easy is it to assemble C-Mac's Shade house? The video was originally produced by our customer Charlotte Webb from Southern Highlands Botanic Gardens in Bowral. 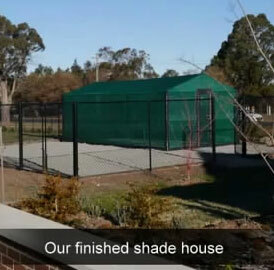 The BIG Shade house construction is done by their volunteers. Why choose C-Mac’s “Spring” Shade House? "I cannot speak highly enough of Suzi, Aaron and the team at C-Mac Industries. They pulled out all the stops to fill our order for a shade house and benching at the Southern Highlands Botanic Gardens. They readily understood our special needs as a garden still in the early stages of development. The products are of the highest quality and were supplied in kit form with easy-to-understand instructions. Our team of volunteers soon proved that the shade house and benches were indeed easy to install. 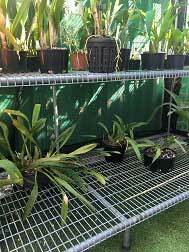 C-Mac Industries ticked all the boxes"
"My C-Mac shade house has made looking after the many different orchids in my collection much easier. The benches are a good width and height and the various parts of the shade house fitted together well and the completed structure feels solid." 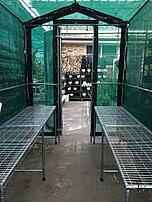 Spring Benches are free standing in shade house (not attached) and are designed to fit into a Spring Shade House. You can stand on this shelf and not bend it. 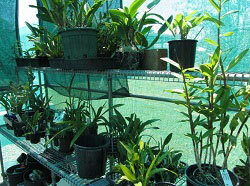 Mesh walls for hanging orchids. What Customer says about C-Mac's Shade house lately? Other nursery equipment such as Shade house with special cover, Shade house benching, Trailer, Pot lifter which also reduce risk of getting injury and increase work efficiency are also available. 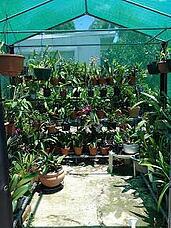 My C-Mac shade house has made looking after the many different orchids in my collection much easier. The benches are a good width and height and the various parts of the shade house fitted together well and the completed structure feels solid.